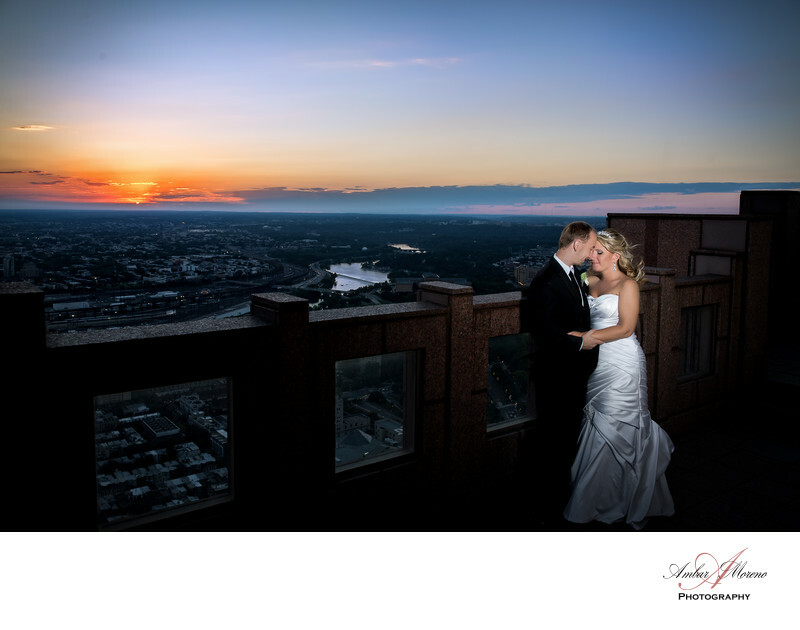 Sky Philadelphia formally known as the Top of the Tower wedding at Philadelphia Pennsylvania. A beautiful summer evening wedding in Center City Philadelphia at the Top of the Tower located on Arch Street. The scene on top of the building on the 53rd floor is absolutely spectacular. Beside the grand scenic view of the city, the sunset was equally spectacular this evening. We asked the bride and groom to accompany us outside as the sun began to set. The sky was absolutely radiant. We had already envisioned the picture that we were going capture. Earlier in the day we had an opportunity to photograph the bridal party inside the venue. As the evening approached, we asked the bride and groom to stop outside onto the deck to capture the surrounding scenic view of center city and the skyscrapers that towering next to the venue. As we do with every couple, we asked them to take a moment for themselves and view the spectacular scene and interact with each other. As they we always expect, the bride and groom were simply enjoying the moment. All I did was wait for key moments to capture the emotion and splendid interaction. Capturing candid moments between the bride and groom is the highlight of the day. The couple are alone and its a moment they will always fondly remember. I will also have beautiful pictures that documented that precise moment of the day. Earlier in the day, the had a spectacular ceremony at the Cathedral Basilica of Saint Peter and Paul, also located in center city Philadelphia. The Catholic ceremony was truly amazing and the church with all of its architecture added what I believe to be be a perfect ceremony. The reception area at Sky Philadelphia on the 53rd floor was elegantly decorated and the windows surrounding the room allows guest to enjoy the scenic view of the city and the light through the windows also added to the ambiance of the room. As the evening turned into the night, the dance floor came alive. Everyone was enjoying the celebration and other guests were just thrilled with looking outside as the street lights and lights from the buildings illuminated the landscape. Sky Philadelphia is truly a spectacular venue that offers so much. The venue is spacious and elegant, and the staff is equally friendly and they are very attentive to their guests. They are equally mindful to every detail and the food is simply fantastic. Well worth looking into the venue if you plan to have a center city Philadelphia wedding. As a wedding photographer, I find that the photo opportunities by far at Sky Philadelphia is superior. Location: 1717 Arch St, Philadelphia, PA.